Dental sealants, also known as Pit and Fissure Sealants, are one of the most effective preventative dentistry measures being used today. Simply put, dental sealants are a coating placed over adult teeth that prevents most cavity-causing bacteria from entering the deep grooves of the teeth. In one landmark study, a permanent first molar without sealants is seven times more likely to develop a cavity than a permanent first molar with a sealant¹. As a result, in our Orange, CT office we recommend dental sealants be placed on permanent molars to reduce the likelihood of decay or cavities. 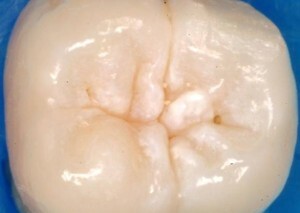 Photograph showing a 6 year molar with deep grooves. This tooth is at high risk for decay (cavities) unless a sealant is placed. The application of dental sealants is quick and painless. No anesthesia nor needles are required! After mechanically cleaning the tooth with a brush, we apply a substance to chemically ready the tooth for the sealant, and then we apply the sealant material. We can typically seal four permanent molars in less than 10 minutes. Once applied, they will provide years of protection and will reduce the likelihood of developing cavities on the teeth. They hold up well against the constant chewing forces and we can observe sealants on 40 year old patients that we placed over twenty years ago! Dental sealants are placed on kids and teenagers as their six and twelve year molars are erupting. We find that nearly all kids are able to tolerate the procedure. Drs. Nicholas and Carla Calcaterra routinely place sealants on pediatric patients in our office. There have been media reports over the past couple of years regarding the use of BPA (also known as Bisphenol A) in dental sealants. We standardized on dental sealants from a vendor several years ago whose products were certified as being BPA free. All dental sealants placed in our Orange office contain no BPA. Simonsen RJ: Retention and effectiveness of dental sealant after 15 years, Journal of the American Dental Association 122:34-42, 1991.